A Morteruelo to Dye For! Cat. morterol, MEng. mortrews, mortreux, mortreus,mortrelllus, Eng morteruelo, liver sauce. 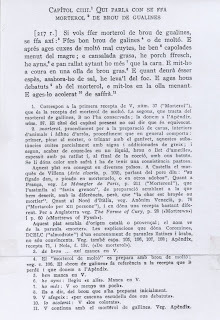 The word is a corruption from OFr mortreux, the plural of morteruel, meaning mortared meat from joints. All ingredients are pounded or mortared to a pulp and passed through a strainer. It is believed the dishes originated in Catalonia or Provenze. In this case, it is a mock foIe gras or liver sauce made with chicken or mutton. The procedure for making this was current during the Middle Ages. Recipes are found in Sent Soví, Arte Cisoria, Le Menagier de Paris and Forme of Cury. The English used meat, fish or lungs. Their recipes consisted of ground meat cooked with spices and vinegar. They can include saffron to produce a thick yellow paste. This type of cooking was extensive throughout the medieval world. Rice “Morterol” or Golden Rice Pudding, consists of rice flour cooked in almond milk, saffron and eggs as a thickener. 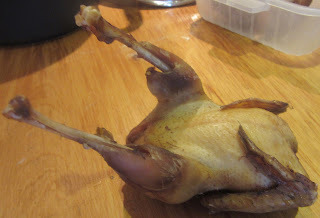 The term has been used for different meat and fowl dishes, which after cooking them in a broth were pounded in a mortar or chopped with a knife and blended with various foods to become a pottage; with some variations in the name and the ingredients several dishes were made. 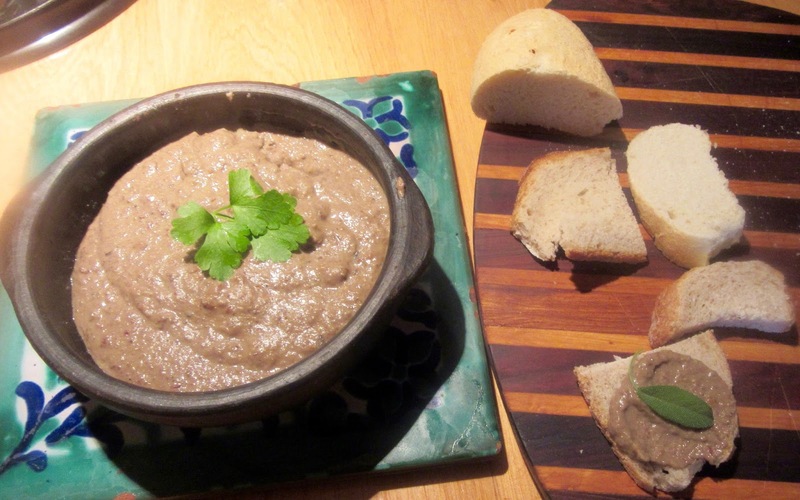 There is a liver sauce made with pork livers that is a traditional dish in the province of Cuenca where some think it originated. 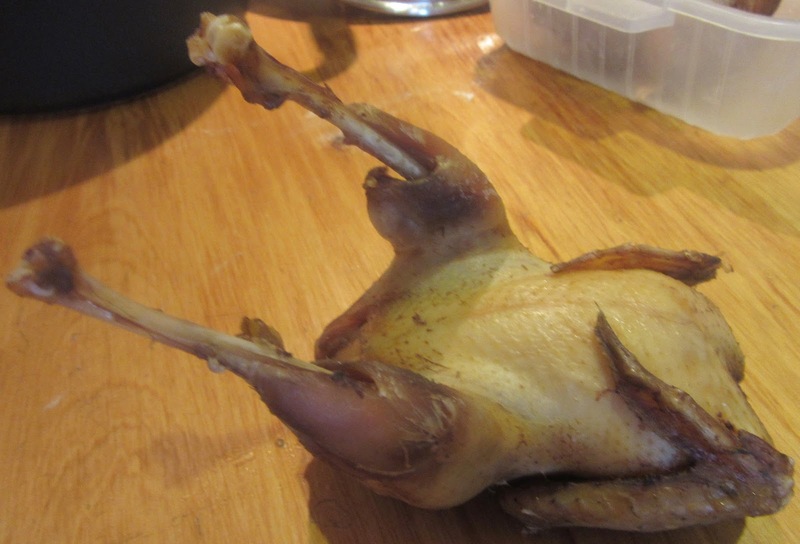 In Toledo, it is made with breasts of red-legged partridges, garlic, a bay leaf and pepper. During the Middle Ages, according to Alfonso de Valladolid (1270-1349), a Jewish convert, in his manuscript Libro de las tres creencias (Book of Three Faiths) cabbage was mixed with it. Traditional morteruelo or liver sauce is served as a spread for bread. Vilanova advised those having cold bodies should not eat it. 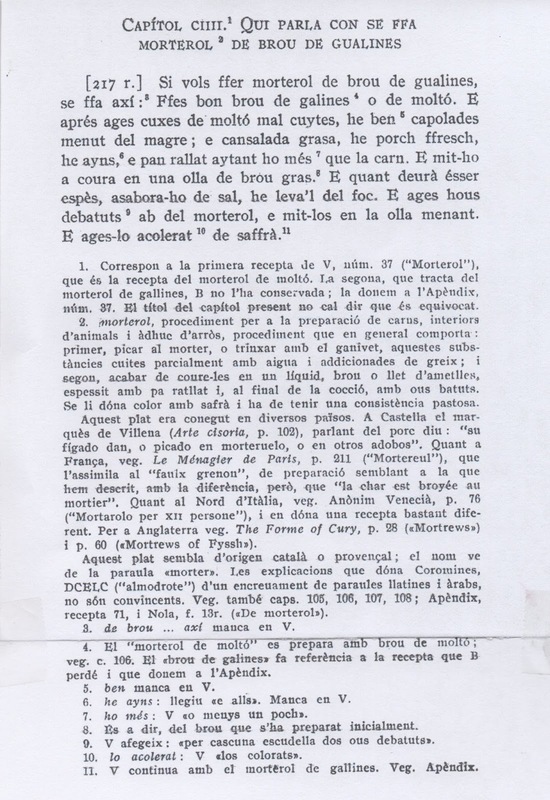 Gázquez points out that Sent Soví's recipe shows two culinary methods that were frequently used in Catalan cookery and extended to the Medieval Christian kitchens as mock foie gras, a liver sauce, as per the Diccionario de Autoridades, ‘cooked like a sauce and made with mashed pork liver and spices’. Al brou, Gázquez continues, means slow cooking, which is possibly of Jewish-Arab origin, although perhaps this procedure is more ancient and comes from Roman or Greek cookery. 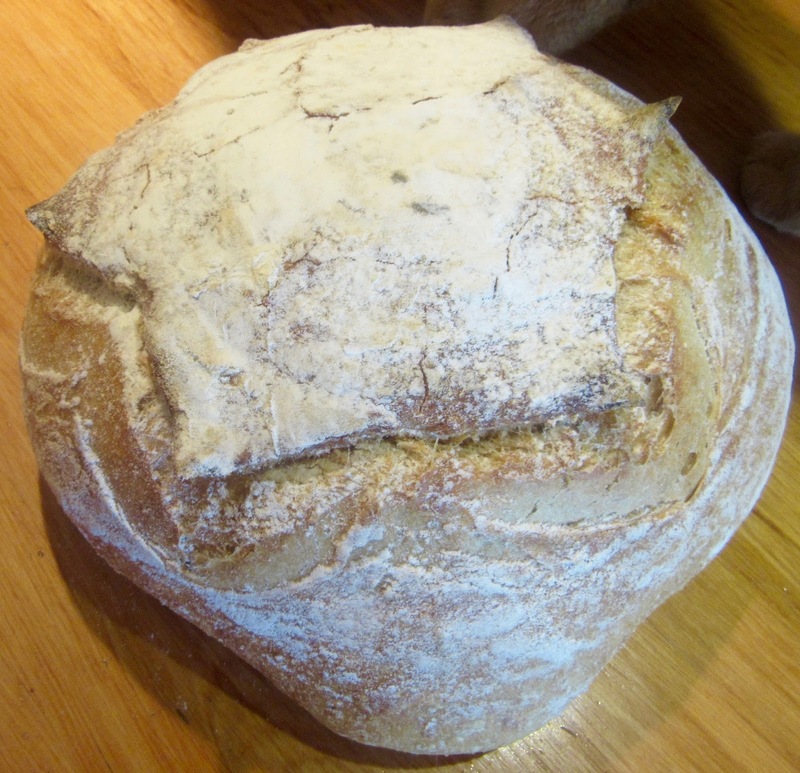 Serve with thinly sliced bread from a 1 lb loaf of bread. 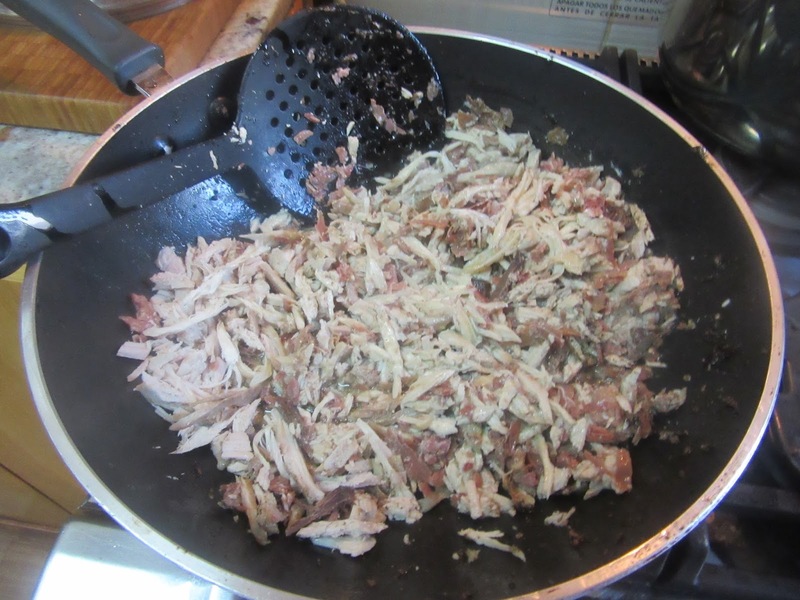 In a large stockpot, combine the chicken, trotters, pork loin, jamón serrano, and ham bone, if using. Season with salt and pepper, add cold water to cover, and bring to a boil over high heat, skimming off any foam that forms on the surface. Decrease the heat to medium-low and cook, skimming as needed, for 1 ½ to 2 hours, or until the meats are tender. Add water as necessary to keep the meats covered while cooking. Bring the reserved cooking liquid to a boil and add the pork liver. Season with salt, decrease the heat to medium, and boil gently for 15 minutes, or until the liver turns pale. Remove the liver from the pot and let cool to room temperature. Strain the cooking liquid again and reserve about 4 cups. Chop the cooled liver and reserve. In a large sauté pan, heat the olive oil over medium heat. Add the garlic and sauté, stirring often with a wood spoon, for about 5 minutes, or until golden. Remove and discard the garlic. In the same oil, fry the bacon over medium heat, stirring often, for 5 minutes, or until lightly browned. Add cinnamon, cloves, and caraway seeds and stir well. Add the shredded meats and grated liver and sauté, stirring occasionally, for 5 minutes. Pour this mixture into a food processor. Add toasted bread and eggs. Blend all well. Return the mixture to the pan. Add the 4 cups reserved cooking liquid, mix well, and cook over medium heat for 20-30 minutes, stirring frequently until smooth and creamy like pate.